Yes... There Really Is a Shangri La! Yes, Dorothy.... Shangri La really does exist! Follow the yellow brick road to Honolulu, Hawaii. 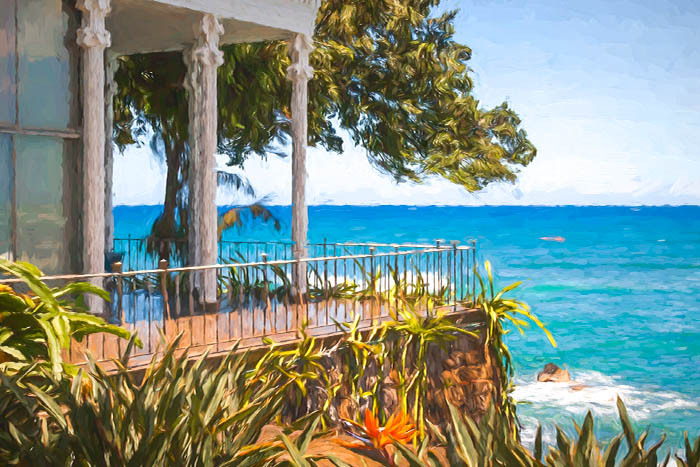 That's where Doris Duke chose to build her real-life Shangri La. Though, it was a long road from beginning to completion, there was no one better suited to this humongous project. Doris Duke, was an extraordinary woman... adventurous, fiercely independent, and one of the world's wealthiest women of the times. She had loads of chutzpah. 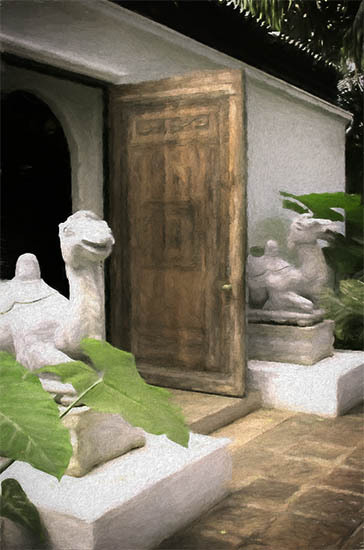 What says "desert" better than camels guarding the front door? Image edited in Topaz Impression. Doris was the only child of the tobacco mogul, James Buchanan Duke who also founded the Duke Energy Company. He died when Doris was 12 and she inherited approximately $80 million, an immense sum in the early 1900's. She was born in 1912 and she was a radically free spirit, especially for the times. A girl after my own heart since she was a dedicated conservationist, passionate about the preservation of wildlife, and a philanthropist.... with a passion for travel! Her first journey was in 1923 when she and her mother went to England and France. 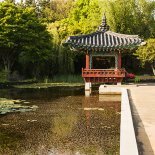 That trip ignited her love of travel and immersion in new cultures. She was 22 when she married James Cromwell (a British political figure) and the two set off for a 10 month tour of Egypt, Palestine, Jordan, India, Indonesia, China and Japan. She was completely overwhelmed by the beauty of the Taj Mahal, its Islamic architecture and art work. Right away she commissioned a prominent Delhi architect to design what would eventually become the "Mughal" bedroom suite in her Shangri La. The seed was planted and her dream kept growing stronger and stronger. The last stop over on the honeymoon was Hawaii and the plans for a 2 to 3 week visit were quickly changed to 4 months. Hawaii seduced Doris and she decided this was the place to build a home. 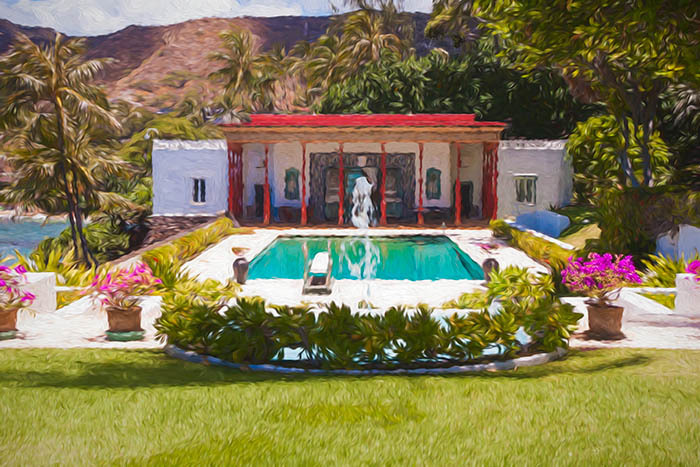 Doris Duke's Shangri La haa a beautiful Playhouse with a swimming pool in front. Wouldn't you love a playhouse like this? I like to make paintings out of my photos. Sometimes I add layers of textures in Photoshop, then adjust blending modes and opacities. The number of textures in each image varies to get the right look. At other times I use Topaz Impression. Topaz is a collection of several "mini" programmes and you can purchase the entire programme and use it as without Photoshop. Or you can buy individual apps to use as plug-ins. So far I use Impression as Photoshop plug-in. Occasionally, I've spent a few hours on an image and it wasn't going where I wanted to go with it. I don't delete it because I might feel totally different about it in a few days. You can get stale and tired working too long on an image. If you feel frustrated, save your work... make sure you save it as a PSD with all the layers... then come back to it in a few days. It might only need a good night's sleep and a minor change to make you love it. Dramatic view of Shangri La's lanai and ocean, taken from the garden. Edited in Photoshop & Impression. This view is taken from the back garden. If you could look to the right, you'd see the Playhouse with ladies' and men's dressing rooms, a living room and the swimming pool in front. And, if you look further behind the Playhouse, there's Diamond Head not too far away. Shangri La is my idea of heaven. I mean, really... wouldn't you want an adult Playhouse with a swimming pool and gardens in your backyard? ... Best In Vertical, Horizontal or Both? Some advice... take photos of landscapes in both vertical and horizontal views. When you get them up on your monitor, you might like one view more than the other. I like the vertical shot below better because of the long water channel and the tall slender trees. The water garden with a large central channel running between tall slender trees. In a hot climate, water is a lovely cooling element. 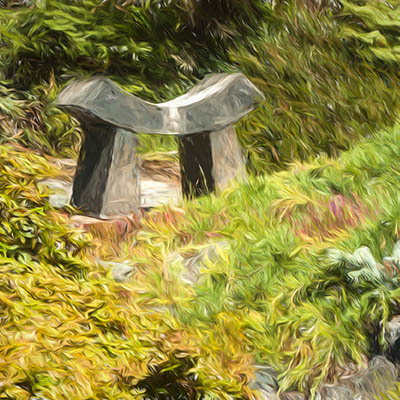 A painterly image. We've made a complete round of the house and gardens now. Back to the front yard... the tour bus is leaving soon. 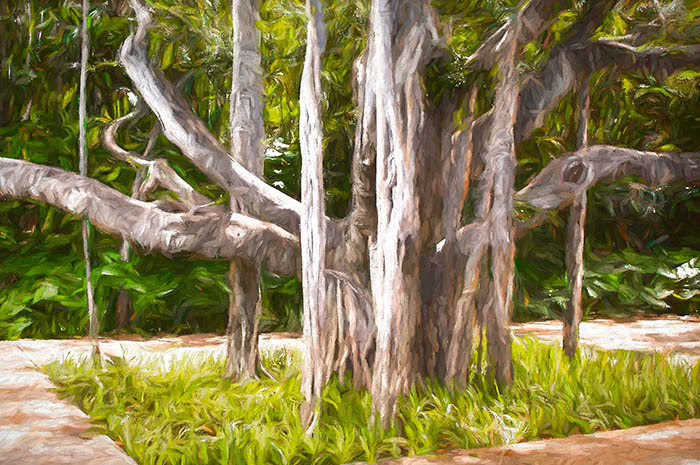 Banyan trees are a photographer's good friend. They're from the Ficus family and they remind me of something out of a fantasy movie. The thick branches have graceful support roots, like cables, reaching down into the ground. Looks a bit "other worldly". They're very common around Honolulu. Great for landscape photos but close ups are interesting, too. Fruit eating birds and various bugs hang out in this weird and wonderful tree so there are always some good macro opportunities. The welcoming banyan tree in the front yard at Shangri La. 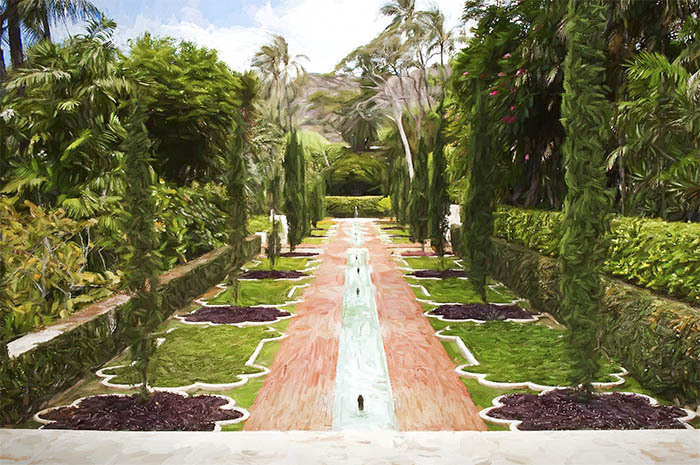 A head's up... if Doris Duke's Shangri La is on your short list of places to visit in Honolulu: You buy your tickets at the Honolulu Museum of Art and they will transport the tour group by bus to the site, then return to the museum. You can't go directly to Shangri La to purchase tickets. All the information is on the websites. No photography is allowed within the house and courtyards. But if you're a journalist or professional photographer, call them well beforehand and arrange to attend one of their journalist meetings. There's a paperback book that the museum sells and if you go on this tour, I suggest you purchase it. The story and photos about her and the building of Shangri La are fascinating.